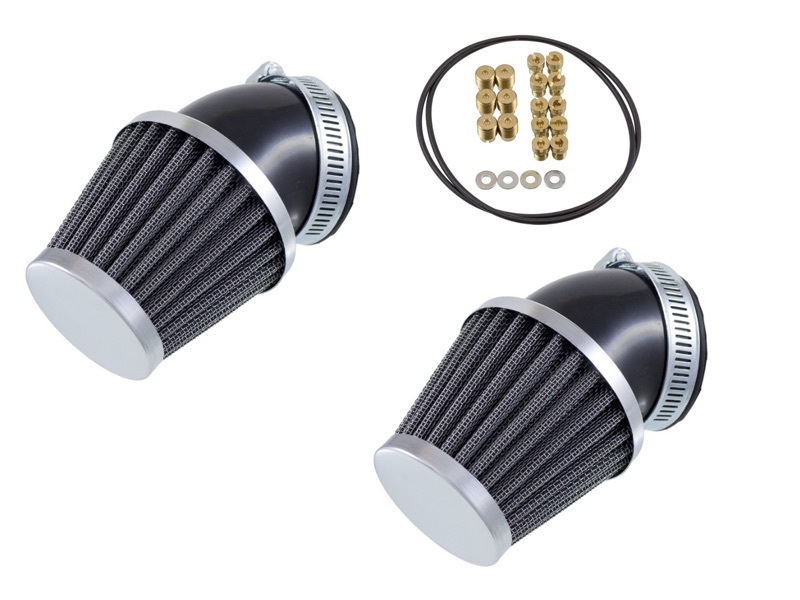 Why You Need This: Pod Filters have become increasingly popular air filter option on vintage Honda CB350 / CL350 Scrambler / CB360 / CL360 Scrambler / CJ360 / CB450 / CL450 / CB500T Motorcycles. They are a thrifty alternative to the original style air filter and box set up, while allowing for easy access to the carbs and a customized look. But...There are some trade offs. While popular there are two things to note when switching to pods. 1) How they mount on the end of the CV style carbs. Many generic filters are shaped in such a way that they actually inhibit the proper operation of the slide on the CV carburetors by blocking air flow the slide chamber ports. This has to do with the shape of the boot over the actual filter material, thus pods have a bad rap that they do not work correctly. Our angled boot pod filters are different as they allow for full flow to the slide chamber ports for proper throttle response. Secondly the angle boot will clear the factory battery box in all the bikes and allow for the use of the side covers. 2) Any change to the exhaust or air filter will require re-jetting the carburetors to make sure the bike performs top RPM. We get commonly asked what sized jet is needed for XYZ combo of parts and the answer is that it is a game of trial and error. Thus we have assembled a jet kit with an assortment of all the jets that your carb may need to get them in proper tune. Installation Tip: Pod filters are a snug fit on the ends of the carbs and next to the battery box. Push the filter on as far as it will fit on the opening of the carburetor. Snug the clamp so the filter stays in place, however over tightening the clamp will cause the filter to pop of end of the carburetor. You will have to experiment with the filter orientation to work best with your bike set up. Use a drop of oil on any O-rings that are on jets when installing them into the carb body for smooth installation. Jetting must be done in stages and based on spark plug tip color. A white plug indicates that the mixture is too lean, while a black plug indicates too rich. Proper color should just be tan to grey when adjusted correctly. A properly jetted bike will run from idle speed to the red line on the tachometer with ease. However, cam chain adjustment, valve adjustment, ignition timing and carburetor synchronization must be done before attempting to re-jet.